The regime of the Ayatollah is the base of extremism. So people of Iran are very right and deserve to get at least a better regime. They deserve to have freedom and democracy. They deserve to have free elections through which they can elect their true representatives. Change in Iran will open the way to end extremism, the extremism born in the name of Islam throughout the region. This is not because Islam is a good ground for terrorism, instead they are using Islam as a tool for extremism and murder. Change in Iran is certainly the beginning of a real change for democracy in the whole region. 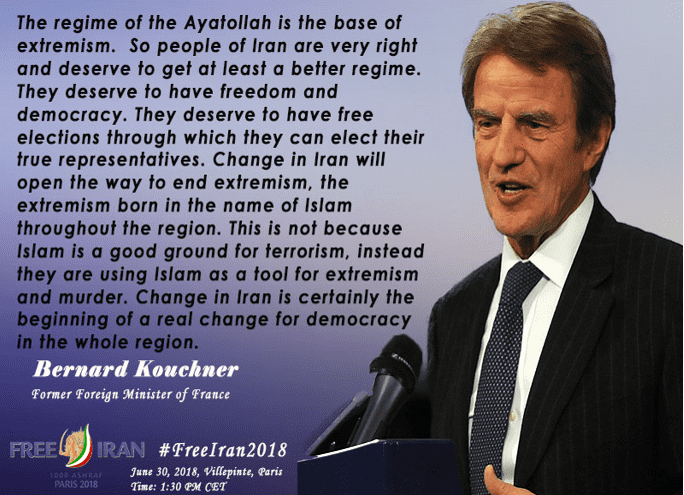 Iranian Opposition: Adherents of the Iranian resistance.